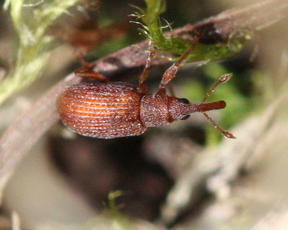 Very small (only 2 or 3 mm) and almost entirely orange coloured. Head and pronotum are punctured. Elytra strongly rounded, broadest behind middle, with deeply impressed striae with rows of indentations. Adults appear late March to late April and depending on season and are abundant by mid May continuing in good numbers until October. Associated with Sheep's Sorrel (Rumex acetosella) upon the roots of which the larvae feed causing galls. Very common throughout the British Isles and generally by far the most common species of Apion. Occasional in Leicestershire and Rutland. There were a total of 16 VC55 records for this species up to March 2015.